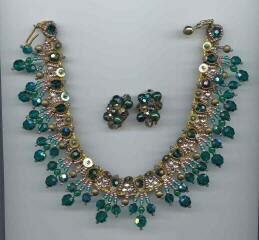 This necklace attributed to the infamous designer Lina Barretti, Circa 1936. This 15 inch hand made necklace includes beautiful seed pearls around each of the beads stitched to the choker, triple rhinestone groups between each dangle with a brass bead below all stitched to a baby soft piece of suede. 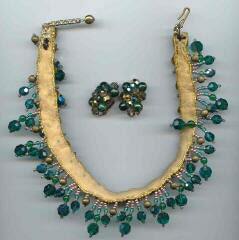 The earrings are a lovely match but probably were married to the necklace Long, long ago.